This Low-Carb Baking Powder Recipe can be used in your favorite recipes. It’s free of starches, grains, and aluminum and will work for low-carb, keto, Atkins, diabetic, or Banting diets. How much do you know about the baking powder you use? Go get it and look at the ingredients. You will probably find ingredients that include aluminum and starches. What is in Homemade Baking Powder, Anyway? 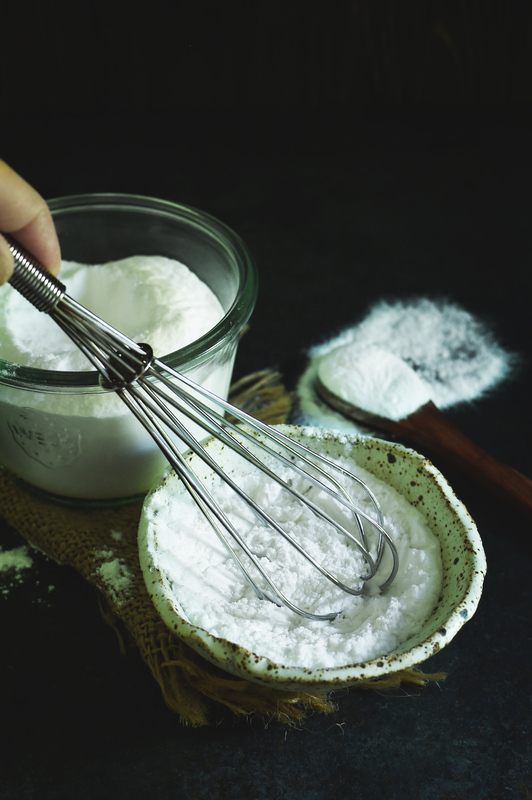 Usually homemade baking powder is made of three ingredients: baking soda, cream of tartar (a dry acid available at any grocery store), and a starch. Baking soda is a base and when combined with the acid, cream of tartar in a wet environment (like your favorite cookie dough), goes through and acid-base reaction giving off little bubbles of carbon dioxide. In short, it fizzes. The carbon dioxide created with this fizzing action gets caught in the batter to create bubbles, causing the baked goods to rise. This rising action gives lightness to cakes, loft to cookies, and lift to biscuits. So if the baking soda and the cream of tartar create the leavening effect, why do we need the starch? Well, the simple answer to that is that the starch is a filler. This doesn’t mean it doesn’t provide and important purpose, though. It bulks up the baking powder so it can be measured accurately. Another function of the starch is that it helps soak up humidity. Water makes the baking soda and cream of tartar react together and the water in the air is no different than the water in your batter. As this reaction occurs in the container, there will be less reaction left to happen in your cookies and cakes. In short, humidity will weaken your baking powder. What Do We Do About the Starch? I have seen some recipes online for low-carb baking powder that just leave out the starch, others that use extra cream of tartar instead. Both of these solutions are not without issues. First of all, by simply leaving out the starch, we create a measuring nightmare. If a recipe asks for 1 teaspoon of baking powder, we would need only 2/3s of a teaspoon of a baking powder made without the starch. I just don’t want to do this much thinking while I’m cooking, not to mention, we have a limited number of measuring spoons available to us. By using cream of tartar to make up the extra bulk, we take care of the measuring problem. However, we add extra acid to the recipe. To avoid these issues, I substitute a fiber for the starch. 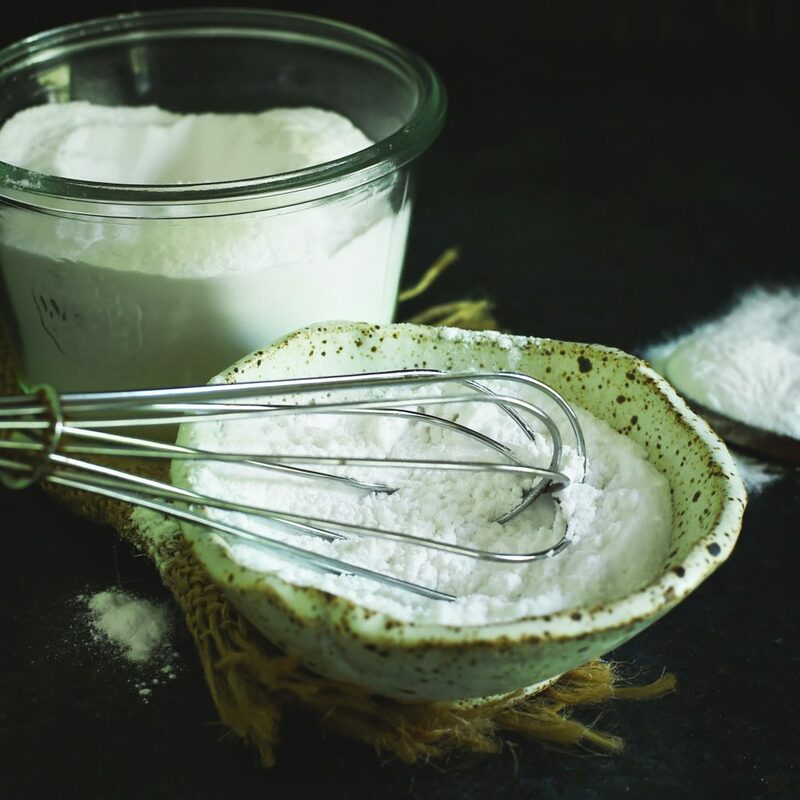 Using a fiber creates the bulk so the homemade low-carb baking powder measures teaspoon for teaspoon like commercial baking powder and doesn’t add excess acid. The fiber I use is inulin. Unlike a starch, the body does not break inulin down into sugars. Instead, it passes through the small intestine undigested (1). When it gets into the large intestine, good bacteria feast on it helping them thrive (2). They break down the inulin into short chain fatty acids (SCFA) (3). Short chain fatty acids go on to nourish and heal the cells of the large intestine. They even provide anti-inflammatory benefits(4). Of course, with my baking powder recipe, there will be only a tiny amount in each serving, so these benefits will be negligible. I just wanted to note that the net effect of inulin on the body is positive, rather than negative. While inulin has a pleasant, slightly sweet flavor, I find that the small amount in the baking powder does not affect the taste of the final baked good. It is even undetectable in savory baked goods, like my low-carb biscuit recipe. I am getting excited about using inulin in more recipes. I like the taste of it, recipe potential and its health benefits. If you don’t have inulin on hand, other powdered fibers would probably work fine in this recipe. In a pinch, a grain-free starch, like arrowroot would work fine. Arrowroot would add some carbs (maybe too much for my keto followers), but a tiny bit per serving. 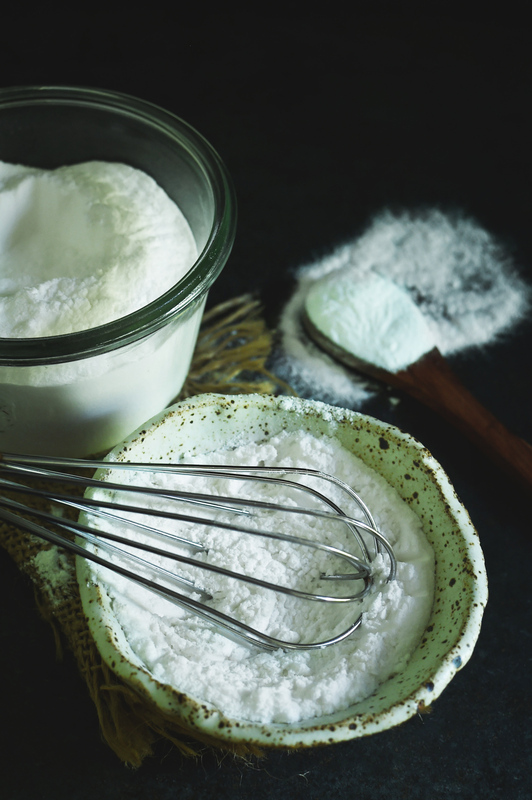 For best results with this Low-Carb Baking Powder Recipe, get the batter into the oven as soon as possible after mixing it up. This baking powder is a single acting baking powder and does not contain ingredients that will get a boost in leavening in the oven like a double acting powder will. Use fresh ingredients in this baking powder as baking soda will lose its potency after a period of time. Also, don’t make a huge batch of this baking powder with the intention of keeping it for a long period of time as it will lose its potency as well. This Low-Carb Baking Powder Recipe will help your favorite low-carb baked goods rise to perfection. Enjoy! This Low-Carb Baking Powder Recipe can be used in your favorite recipes. It's free of starches, grains, and aluminum and will work for low-carb, keto, Atkins, diabetic, or Banting diets. Mix all ingredients together well. Use as you would any baking powder. Corn starch would work fine, but would not be grain-free and would alter the nutritional values. This is so informative! I had no idea what the ingredients in baking soda were or how they worked. It’s great to get a better understanding! This is great information and a great alternative to the grocery store baking powder. I had no idea you can make baking powder using baking soda. Must give it a go! Honestly I had no idea, you could make the low carb baking powder.. Thanks for sharing this awesome recipe. What a cool idea! I had no idea how to do this and I can’t wait to give it a try!